Francis and I visited Dorset this week, staying in a cottage near Lyme Regis. Whilst there we visited Thomas Hardy's house in Higher Bockhampton. It is a small cob and thatch building where he was born in 1840 and where he lived until he was 34. During this time he wrote two novels: Under the Greenwood Tree (1872) and Far From the Madding Crowd(1874). He left home to marry Emma Gifford, the daughter of a solicitor. 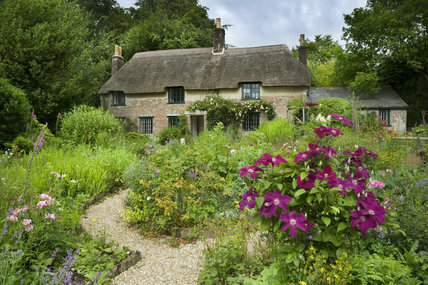 The cottage was built in 1800 by his great-grandfather, and has a typical cottage garden, the interior of the house has furniture of the period although not from the Hardy family. Even although there were numerous other tourists in the house when we were there, I found it completely charming and peaceful. It was all so simple and I think not much different from when Hardy lived there. There were three small bedrooms, white washed, with quilts as bedspreads, china chamber pots, and a Bible by the beds. All one wants in a bedroom I would say. In the kitchen there was a small table and a big stove for cooking on, oh and a shelf or two. The floor was made of flagstones, now a faded pink and, I found it easy to imagine Thomas walking over them, pipe in mouth. I looked out of the very small window where he did his writing and saw flowers and woodland. There I thought was his inspiration for his first novel: Under the Greenwood Tree. And I really felt him there beside me. If you are in Dorset and haven't been I do recommend it as a lovely outing. from oaken doors, black studded. "Keep out" outdared by my skylark spirit.